Gain 1credit when your turn begins. The Runner's maximum hand size is increased by 1. The whitewashed walls dropped away and a beautiful zen garden appeared. It was all an illusion, but it was a comforting illusion. Don't be anxious. Here, trim this tree. 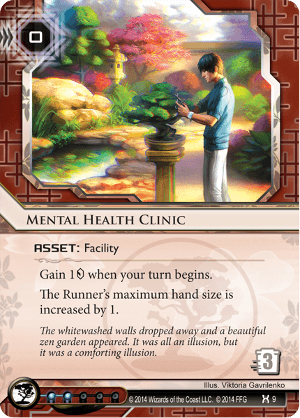 Mental Health Clinic forces you to choose how you're going to make it hard for the runner to win. Are you going for a vicious Scorched Earth flatline? Or are you going to tax the runner's credits? Or something else entirely? Runners have access to resources, and corps tax those resources to prevent the runner from dancing all up in their servers. Most commonly, those resources are credits, clicks, and cards. In terms of which corp factions are particularly good at one of these, NBN takes your money, HB makes you spend clicks, and Jinteki makes you trash cards. Weyland just burns your house to the ground laughing while swimming in piles of money. When Honor & Profit first came out, I thought MHC was only appropriate if you weren't choosing to deal damage to the runner, as a larger hand size means a more difficult flatline. I found it difficult to tax credits in Jinteki, and so I dismissed this card as not very good. As I get more experienced with Netrunner, I'm learning that taxing cards and flatlining are different. Hand size doesn't matter if you're able to continually do small amounts of net damage. Over time, the clicks spent to draw back up are very taxing, and all those cards in the runner's heap aren't doing them a lot of good. Most out-of-faction decks, as most have access to drip econ options without spending the influence on MHC.